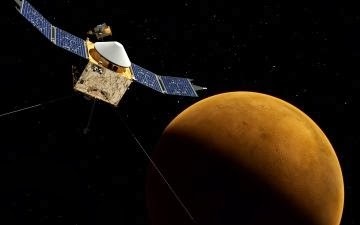 CAPE CANAVERAL, Florida -- NASA's MAVEN spacecraft cleared its last mission review, called the Launch Readiness Review, which took place today in the Mission Briefing Room at NASA's Kennedy Space Center. NASA and contractor managers gave a “go” to proceed to launch aboard a United Launch Alliance Atlas V rocket on Monday, November 18, 2013 at 1:28 p.m. EST from Space Launch Complex 41 at Cape Canaveral Air Force Station in Florida. There is a 2-hour launch window for the Mars-bound spacecraft. On Thursday, controllers turned on the MAVEN spacecraft and the NASA and United Launch Alliance launch teams performed a successful countdown dress rehearsal. As of November 15, the U.S. Air Force 45th Weather Squadron forecasts an 60% chance of favorable weather conditions on launch day. The primary weather concerns for launch day are cumulus clouds, disturbed weather, and thick clouds.